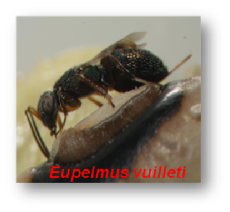 Eupelmus vuilleti and Dinarmus basalis are two solitary parasitoid species exploiting the same hosts: larvae and pupae of Callosobruchus maculatus. In tropical Africa, this Coleopteran species is an important pest attacking cowpea seeds stored in granaries. Within these relatively closed storage systems, hosts can be abundant and parasitoid populations may highly fluctuate, potentially leading to high intra- and interspecific competition levels. 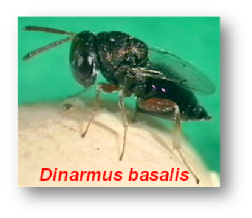 When confronted to already parasitized hosts (exploitative competition), D. basalis females tend to avoid superparasitism and multiparasitism. In contrast, E. vuilleti females tend to accept parasitized hosts, even sometimes preferring them to healthy hosts. Eupelmus vuilleti therefore seems to be dominant and potentially able to exclude D. basalis. How can D. basalis persist when in sympatry with E. vuilleti? And how can D. basalis females successfully protect their host against allospecific intruders during its exploitation? During my PhD project, I have investigated females’ ability to directly protect a host (and therefore their offspring) against conspecific and allospecific females (contest competition, Fig. 1). I have also explored the strategies adopted by both species when in direct competition and I have tested the effect of factors modifying host value (resource value, RV) and fighting abilities (resource holding potential, RHP) on females’ aggressiveness and contest outcome. I am currently studying female behaviours at a higher level, i.e. when exploiting a patch of hosts. Here, my aim is to explore the strategies adopted by females facing a trade-off between exploiting the remaining unparasitized hosts and protecting the offspring already invested in a patch. I will try and determine whether D. basalis females can definitely exclude E. vuilleti females from the patch or E. vuilleti females wait until D. basalis has left the patch and do multiparasitism possibly preceded by ovicide. 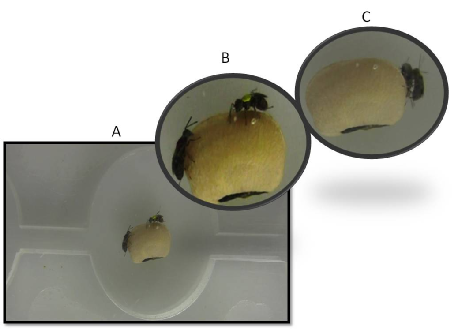 Figure 1: (A) Two E.vuilleti females exploiting simultaneously the same host in an experimental device. (B) One female detects her opponent and raise her antennae in her direction. (C) one female pursuits and attacks the other. 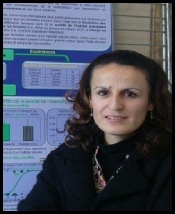 2007-present: PHD Student, IRBI (France). Mohamad R, Monge J-P, Goubault M. 2011. Agonistic interactions and their implications for parasitoid species coexistence. Behavioral Ecology. 22:1114-1122. Mohamad R, Monge J-P, Goubault M. 2010. Can subjective resource value affect aggressiveness and contest outcome in parasitoid wasps? Animal Behaviour. 80:629-636.